It’s that time of year. The time when everyone seems to have more zucchini than they know what to do with. If that sounds familiar, then I recommend making a big batch of these Zucchini Fritters. Other than myself, no one in my family really appreciates zucchini. 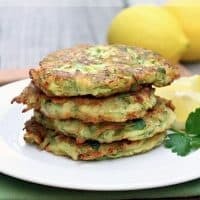 My family is pretty fond of eggs though, so I thought maybe, just maybe, they might go for these zucchini fritters–even though they could see the zucchini, and taste it too. I, of course, loved these tasty fried zucchini pancakes and would have happily eaten them all myself. But I didn’t get a chance, because the rest of my family (minus the 9 year-old) actually liked them. The teenagers preferred them dipped in Ranch dressing, and my husband enjoyed them with a bit of lemon juice. I liked them best as is. 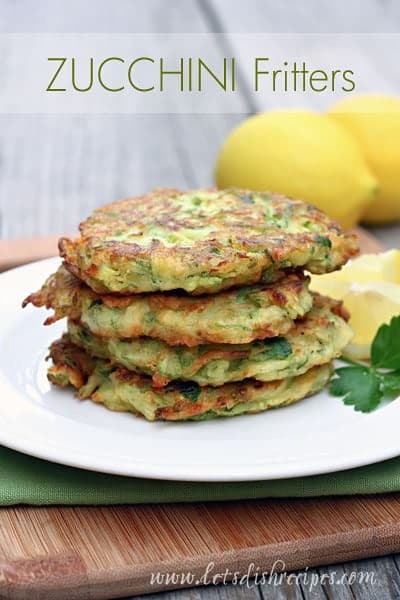 Who knows, these tasty squash-filled fritters might just help your family appreciate zucchini too! Place the zucchini in a colander over a medium bowl. Sprinkle with salt and toss gently. Allow to sit for 20-30 minutes to release juices. Squeeze any excess moisture from the zucchini and place in a medium bowl. Stir in the lemon juice and zest, parsley, garlic, pepper and eggs. Slowly add the flour, stirring so that no lumps form. Heat the olive oil in a large saute pan over medium-high heat. Carefully drop about 2 tablespoons of the zucchini mixture into the pan, spreading the batter slightly with the back of a spoon. Repeat, spacing the fritters a few inches apart. Cook fritters until golden, 2-3 minutes per side. Transfer to a paper towel lined plate and keep warm. Repeat with remaining zucchini mixture. Garnish with fresh parsley and lemon wedges, if desired. These fritters look delicious. Where I live we have been making these for years and I highly recommend them. “Allow to sit for 20-30 minutes to release juices. Squeeze any excess moisture from the zucchini and place in a medium bowl. Am I placing the in the bowl, or the juice of the zucchini, or all of it and then mixing it with the lemon, etc? Or am I discarding the reserved juice/liquid that drains from the colander? Sorry, I really want to try this, but lately I’m messing up nearly every recipe I try. 🙂 Thanks! The added salt will naturally draw out the moisture of the zucchini. After letting it sit in the colander, while it is still in the colander, press out any extra water from the zucchini. Then, transfer the zucchini to the bowl and add the other ingredients. Happy cooking! You want to have the squash as dry as possible. Let is drain, squeeze it in a paper towel and discard the water (or use it in a soup). Moisture will create soggy fritters. Made some of these delicious fritters the other day. I added some bacon because, well, we’re carnivores!! They turned out great and it won’t be long before I make them again. Thanks Danelle.